What would cause my right tire to start rubbing on hard right turns? It has never done this before and just recently started. My car was lowered previous to my buying it but I've owned it over a year and it just recently started doing this after getting a clutch job. Also I am not sure if it is my breaks or suspension but my car has been very squeaky lately. Last edited by Bdawg22; 10-05-2010 at 08:52 AM. 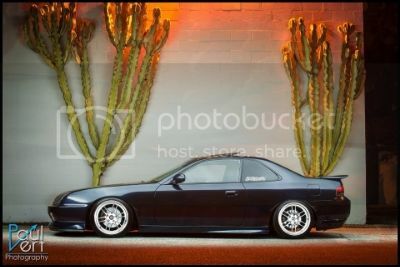 Probably lowered too much, or lowered with too great a tire/rim offset, positive or negative. Yeah but its always been lowered to the amount it is now and I've never had problems. Yes if it's a new problem then get the alignment checked. Also check that any splash guards, inner guards and assorted other plastic bits under the car have been refitted properly. My bad I didn't see the part where it said recently. Get the alignment specs checks (alignment should be done anytime you do any front end work, and for the clutch that involves removing the axle and such) and see if everything is where it is supposed to be. Other than that, do what Brash said and check the fitment of the inner spash sheild (need to be removed when doing a clutch job) and make sure everything is where it is supposed to be. Radius rod nut might be loose. Does it rub in the back inner fender? Like behind the tire? Yeah it's rubbing against like a screw and the surface the screw is screwed into. The only problem is I am sort of a newb as far as cars go; I probably wouldn't know if something was not in the right spot to begin with. Last edited by Bdawg22; 10-06-2010 at 03:13 PM. I just fixed that problem on my lude. It's the radius rod. If you take the plastic under the bumper you can see the both nuts on each side. Tighten the side that giving you a problem. So tighten the screw it is rubbing on? No no no. Just take it to a shop. Or google radius rod and read about it. The nut to tighten it behind your front bumper. Okay I'll see if I can figure it out, if not I'll take it to a shop, thx guys I really appreciate it. On another note though could this be another reason for all the squeaking I've recently started hearing as well? As an additional idea to keep in mind: your damper on that side could be bad or on its way out. With the damper blown, it allows for more bounce/travel which would cause the sudden rubbing. I'm just crossing my fingers whatever it is, it won't be expensive. I just dropped $1150 dollars on my clutch, breaks and registration. Seven months prior I spent $650 on my timing belt. Not really in the position to spend some big bucks right about now. Alright so I got under there and found the bolt you were talking about...the side that was rubbing was not tightened at all...I could have screwed it off in like 5 turns I'd guess. I tightened it a little past finger tight so i couldnt budge it with my finger. Do i sorta just have to play it by ear as far as how tight it needs to be? Good job. Umm I tightened mine till it wouldn't turn. That bolt needs to be reall really tight with a socket not by hand. I hope it worked. Does it still rub? Take a pic if you can to see if your tightnening the right bolt. Here is the pic. I tightened it quite a bit with a wrench i'll just see how it reacts.